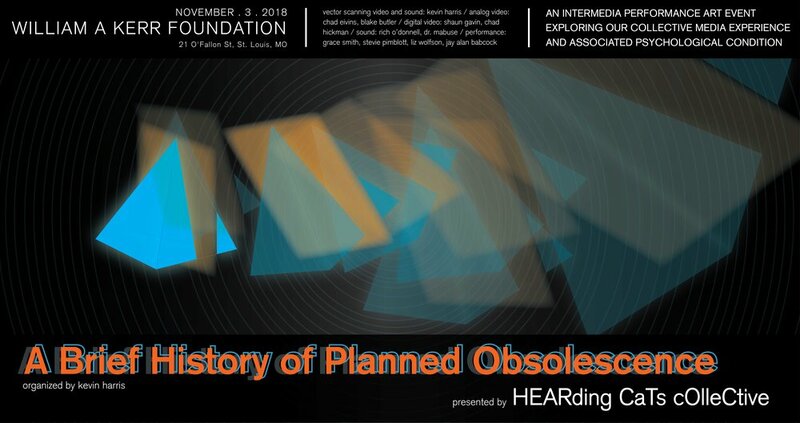 HEARding Cats Collective is pleased to announce A brief history of planned obsolescence - a three-act / performance art / intermedia / representation of our moment in time. As media continue to document the representation of our culture, it is the subtle changes in media itself that influence our more implicit psychological and emotional conditions. Told from the perspective of humans existing between the 20th and 21st centuries, this performance captures ephemeral moments in time where childhood and adulthood coincide with changes in electronic media. As we stumble our way through life and aging, humans are forced to adapt to technological changes that often have little to do with nurturing the human experience. Changes in media are increasingly dictated to society by corporations attempting to maximize profits. When these rapid changes occur - without the approval of the public - supplanted technology disappears from the culture, leaving useful and beautiful media to exist only in the memories of people. A brief history of planned obsolescence utilizes three levels of the Kerr Foundation. Each level will host a unique performative setting revolving around video formats of the past and present. These video formats rep- resent events in our chronology categorized by the concepts of work, play, and dream. As performances take place corresponding with these events, they are captured and processed in real time by their associated video format: Digital (work), Analog (play), and Vector Scanning (dream). The discrete performances on each level form a holistic system in which information from one setting is passed to another to initiate kinetic events. Rollerbladers receive instruction from typists and use movement to control sound. Typists are conducted by synthesizers. Aqua creatures play duets with electronic versions of them- selves. Ultimately, visitors will see an all St. Louis cast of 12 performers, 8 large-scale projections, multiple multi-channel audio systems, and 3 performance art events. The event takes place on November 3rd, 8:00 PM @ The William A. Kerr Foundation, 21 O’Fallon Street, St. Louis, MO 63102.